Tom, who has been teaching and coaching for over 10 years or 10,000 hours, has experimented with what worked best for his students. His improved approach to teaching increased the chance that the students “got it” and became hooked, which of course is a win for everyone. Most of all the student, whose life has just become 100% more amazing, but also for all the schools, the dealers and the whole industry. So for everyone who wants to become an expert in coaching, instruction or teaching, here is what Tom has learnt from being a sports coach, condensed into 25 points. People are always pleased to see people who are pleased to see them. Students that are new can be out of their comfort zone and nervous. Relax them instantly with a calming smile, imagine you are seeing a long-lost friend, if possible show some teeth. Always remember your student’s names and pronounce them correctly. If you want a great life, ask great questions. If you want a great lesson, ask great questions that get your students talking. It’s all about the questions but not just any questions. Start with open-ended questions such as what, how, when and why? For example, “why do you want to learn” gets people talking about themselves and affirming their interest and their reasons for learning. Listen to their answers for clues on how you can relate your lesson to what they know all ready. We only remember around 20% of what we are told but we can remember up to 90% or more of what we talk about or write down, after or during an activity. Tell your students this and they will understand why you are asking them so many questions. Don’t be afraid of silences. Give your students time to think and work out answers on their own as they will remember their own answers. If they do struggle never make a student feel slow or stupid, help them out, give them some clues remember no one knows all the answers. Asking questions will also help you to get know your student. This is a massive positive. The more you learn the more you earn and the same is true in teaching, as the more you learn about your students the more you can help them to understand what you are teaching. If possible put the instruction aside and just get to know the people you have just met, be authentic and remember we are human, make friends if possible, if not possible find something to like about them, if you ask enough quality questions you will find something interesting and amazing in everyone. I have personally found the people who start off to be quiet or difficult can become your favorite students once you make the effort to understand them. You can learn a lot from each and every student even if it’s simply how to be more patient or how to explain yourself more clearly. 3. Three is the magic number. Ask yourself the question if I can summarise my lesson into the three most important points what would they be? Write them down or better still get the student say them out loud and write them down. According to research, writing on yellow paper helps to imprint information on our subconscious minds. Explain to your student the 4 learning stages and respectfully inform them which one they are in and relate how you intend to get them to the top level. Practice can be made more effective by a technique called purposeful practice. Which means to make practice more demanding and can lead to improved progress. To make the purposeful practice work you will need to be creative. One famous example in tennis is the Williams sisters, who had multiple tennis balls fired at making their training much more difficult. When they were competing in the competition having just one ball to return it made their training more effective and helped give them the edge they needed to be hugely successful. Make sure your students know that no question is a stupid question. Selling isn’t telling and all teachers are sales people. How do you think you can stop that from happening? What’s the best thing you think you could do to improve? These are some powerful questions that if asked at the right time and in the right way can have a massive positive effect on your student’s progression. The best coaches are not the best at whatever they coach, they are the best coaches simply because they know what questions to ask, how and when to ask them. Think about the answers that you want to hear from your students and design your questions to draw out the answers. Set SMART goals, Specific, Measurable, Attainable, Relevant and Time-based. If at all possible find a way to get students to make a decision that they want to learn and that they believe that they can do it. Set goals specific to the individual student. Everyone learns at different speeds, this is where experience helps but common sense also prevails. When we are achieving our goals, we feel great and have momentum hence why we must set goals in the first place. If we got in a car without knowing where we were going we would just drive around aimlessly. We must have a destination. Bombarding our brains with lots of information at once is crazy. It can become boring, frustrating and annoying. Attention spans in the classroom can be scarily low especially if people are excited or nervous about an activity. A short theory session is the best method. If possible stick to 3 main points. A short theory session before and debrief after can make a huge difference in the absorption of new information, especially in different environments such as indoors and outdoors. 8. The best teachers relate something the students knows to what they are teaching. 9. Explain how a student may feel at some point during the lesson. Some call this frame working and it is very effective but you must be careful. For example – If you know some task in particular is going to get frustrating and you inform your student to ‘budget’ for some frustration then when they feel frustrated as they were “pre-warned” so they do not feel stupid, alone or slower than everyone else. It can also take the edge of any negative feelings and can also enhance your credibility as an instructor. However, if you tell someone an activity is easy and they struggle, their motivation or confidence may suffer. The same goes if you tell someone that something will be difficult then they may make it more difficult than it needs to be. 10. Use Visualisations and mental rehearsal. Whatever the mind can conceive it can achieve. If you can clearly see yourself doing something then you will do it. Visualisation has been used for many years because it works. All top sports pros visualise themselves doing the task in as much detail as possible before they perform, they think about the feelings they will feel when they accomplish something, they emotionalise what they want to happen, rehearse it mentally by seeing the desired result in every detail possible and how to react in many different situations. The effectiveness of visualisation is backed up by science too. Watching a video the night before an activity can make a huge difference to progression as it gently introduces the mind to what it is going to process and can imprint on our subconscious mind, all of which can help us perform a new task more easily and accelerate our learning. 11. Get your students to believe they can achieve it. Believe in your students. Encouragement and praise are the best ways to teach. Period. Think of a baby taking its first steps, do we criticise and tell the child what it is doing wrong? No. We cheer for every step and even as adults this can be the best method to keep your students motivated. A great guide is the 80/20 rule of 80% encouragement and 20% correction. However, praise must be genuine so make sure you can seek out all the positives. 12. Praise effort, not intelligence. Praising effort, not intelligence encourages us to work harder and to learn a new sport or a new skill there are no shortcuts. We must put in the effort. If our intelligence or ability to pick something up quickly is praised we can become lazy and think we don’t have to work at something so hard. 13. Always use positive language. Classic negative language examples are students saying “I always have problems with” or “I can never do this”. Basic psychology says that if we keep saying something over and over again it becomes us. Using the word “try” can also set students up for failure. Don’t try it, just do it. If you can’t do it yet, keep doing it until you can or work out a way how you can adapt. 14. Keep the student’s attention. Bored students are not going to learn much. Manage lessons to keep them busy. Doing nothing while waiting for their turn is not maximising their time. Involve students as much as possible. Use them to demonstrate. Talk them through what another student is doing so they can use their downtime as learning time. Get them to assist in some way. Ask even more questions. Be enthusiastic and passionate, especially when things are going wrong. There is always a positive for every negative, there is always an opportunity in any adversity. If you keep crashing, its ok, you become an expert in getting back up again. A top sports instructor must always be positive, never show frustration with anyone, be a role model, always find the positives and keep energy as high as possible. It is possible to be positive and realistic AND honest. If something really is a disaster the great learn from it and it’s learning from terrible mistakes that make the great, great. Circumstances out of your control such as weather, people or equipment failure require extreme levels of positivity. Nothing is good or bad, it just is, we are in control of how we react and if we decide if something is good or bad or not. If you are learning something that you have to teach, I guarantee you will put in extra effort to learn as thoroughly as possible. If you tell your students before they learn something that they will have to teach, demonstrate to others or they have a TEST at the end they will listen to that little bit more intently. The reality is that when we teach something we really learn it ourselves. Teaching someone something you don’t know very well can be uncomfortable which helps us to have a greater understanding as well as recall information. Ever heard of paralysis analysis? Reassure students that it takes time to learn don’t fall victim to over analysing, which can make simple tasks seem complicated. Einstein said if you can’t explain something simply then you don’t understand it enough. If it’s not fun what’s the point? It is a fact that racehorses perform their best when they are happy and the same goes for students. The best instructors and coaches somehow work out a way to make learning into a game that is fun. Each different task is a stage or a new level in the game. If learning is fun our motivation is high. Great motivation brings great desire and desire is the starting point of all achievement. Hydration, hydration, hydration keeps us alert and focused. Stopping at least every 45 minutes can have a huge benefit to focus and energy levels. Peanuts are one of the lowest GI food stuffs which means less chance of energy spikes, however caffeine and energy drinks may not be great for sustainable energy but can help psychologically when not progressing or getting tired at the end of a lesson. Learning a new sport or a new skill can be physically tough but also mentally demanding. If students start regressing by making silly mistakes it’s generally because they are fatigued in some way. Stop, rest, talk about something else, tell a joke, drink as much water as possible have a light snack. Do anything to take your students mind off a task and think about something else, then get straight back on it. 20. Surprise or shock your students. Shouting (nice things), saying things they don’t expect, adding funny music, whatever you can think of, be as creative as possible or just get their attention, do something out of character to reinforce the learning. It works. 21. Monkey see monkey do. Demonstration is key to instruction. If a student can clearly see something done over and over again right in front of them they will begin to believe they can do it too and belief is everything. Demonstrate as slowly as possible emphasising the key points. A useful technique is to continue demonstrating until the student demands to have their turn. It is highly likely that if something goes wrong it’s either at the beginning of a session or at the end. If you tell the student that this is their last attempt then they may put too much effort in and/or overthink the maneuver. Couple that with being tired at the end of the day and it can be a recipe for disaster, broken equipment and even worse broken bodies. The golden rule or the unwritten rule is to do unto others how you want done to yourself. If possible give your student a little more than they expect. When you prepare for your lesson, think of any little extras you can offer that the student isn’t expecting. Video coaching is a brilliant tool to use in sports and technology is now more inexpensive than ever. 24. Always end on a high!!!! Even if it is a disaster session, go backwards and end on something that the student can do. If need be, stay a little longer with your student to maximise the chances of finishing on a high. If a lesson finishes on a low, motivation for the next session as well as all the preparation for the next session will also below. A great instructor and coach keeps in contact with their students They reinforce what they have learnt by forwarding any videos or articles relating to their lesson that could be of help in the future. Also, asking students to write down what they learnt as this further reinforces their learning even if it’s just explaining what they learnt in their own words. They ask their students for feedback and take criticism constructively. There is always room for improvement. Spending time with other instructors who love what they do, always want to improve themselves and want to be the best at what they do can have a huge positive impact on your lessons. 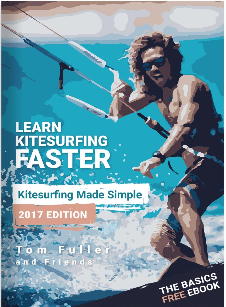 Tom has also written a book that could help your students to Learn Kitesurfing Faster. 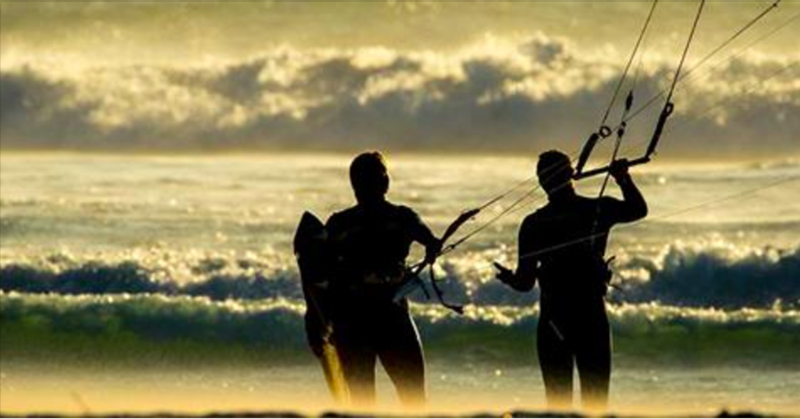 A free version that could be of help for anyone thinking of learning to kitesurf and that will inspire them to have lessons is available to download here.